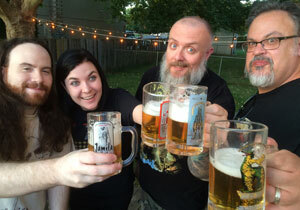 Bryan, Rachel, Kyle and Jeff get loopy in this trainwreck of an episode. We’re back with another hangout, conversational, yet-to-be-named-as-0f-this-recording, explicit episode because I’m so damn slammed with all of the things! That said, the episode that was originally slated for this sequential number designation (#143) will be released shortly… when the controller comes back up for air, of course. Seriously though, you demanded it so this is what you get – two hours of me trying and failing to keep the train on the tracks….much like Ford Brody tried to do with the nuclear warhead in the 2014 Godzilla. I know, that’s a serious stretch. Maybe you can make some sense out of this installment of the podcast. We’ll probably be back a bit sooner for another one of these (post G-Fest wrapup, perhaps?) but for now, I hope you like hearing my cohosts cranked up to 11 because that’s what you’ll hear. Oh, one more thing, due to a crazy recoding thing that happened in the studio, this episode sounds a little strange – Jeff sounds like he’s one Skype, so I apparently need to teach him how to use a microphone. I should have it all back to normal and some recording sense slapped into El Jefe by the next recording. *OH, AND ANOTHER “ONE MORE THING”: Just a quick correction to the episode regarding G-Fest. Apparently, I assumed (yes, I know what happens) and was WRONG: the Symphonic Fury concert is actually on Friday night (thanks to VVeber for even bringing that to my attention!) so we will have the listener party on Saturday night of G-Gest after all.